NOTES: This is a post ep for The Firestorm and sort of a ‘pre ep’ for Justice Interrupted. The man is an Assistant Director in the FBI for cripes sakes, he had to know what his agents were up to!! 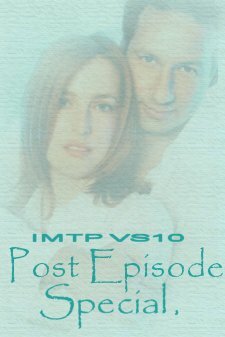 AUTHOR’S NOTES: Written for the VS10 Post-episode challenge. Many thanks to dtg and Vickie for beta. DISCLAIMER: Scully and Mulder belong to 10-13, Fox, and CC. Gabrielle and the rest of the Small Fries crowd belong to Kel, and I thank her for sharing them with us.